"Saint Gregory of Narek, a monk of the tenth century, knew how to express the sentiments of your people more than anyone. He gave voice to the cry, which became a prayer of a sinful and sorrowful humanity, oppressed by the anguish of its powerlessness, but illuminated by the splendor of God's love and open to the hope of his salvific intervention, which is capable of transforming all things." This is the first translation in any language of the surviving corpus of the festal works of St. Gregory of Narek, a tenth-century Armenian mystic theologian and poet par excellence (d. 1003). Composed as liturgical works for the various Dominical and related feasts, these poetic writings are literary masterpieces in both lyrical verse and narrative. Unlike Gregory's better-known penitential prayers, these show a jubilant author in a celebratory mood. In this volume Abraham Terian, an eminent scholar of medieval Armenian literature, provides the nonspecialist reader with an illuminating translation of St. Gregory of Narek's festal works. Introducing each composition with an explanatory note, Terian places the works under consideration in their author's thought-world and in their tenth-century landscape. "Highly recommended to anyone wishing to know more of Gregory of Narek. This book also provides a translation of liturgical works that can be appreciated as a form of poetry in their own right, capable of delighting any reader." 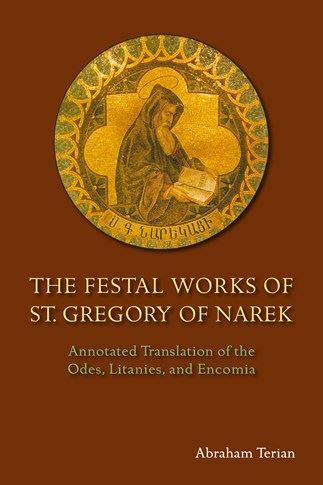 "Translated and annotated by Abraham Tertian, The Festal Works of St. Gregory of Narek will be of greatest interest to scholars in the fields of religion, history, and literature. Like Samuelian's translation, however, it too is a book that should capture the interest of poets and general readers seeking deep spiritual reading for reflection." "Dr. Terian unlocks the essence of these poems, consistently exposing their biblical matrix and patristic roots, introducing readers to the latest research in these fields, and basing his translation on the most reliable textual foundation." "A handsome and valuable volume offering a variety of writings from a learned tenth-century monk and mystic. Liturgical Press is to be admired for continuing to recognize that scholars (and would-be scholars) rely on the availability of such well-researched and spiritually nourishing texts." "Terian's work is truly massive, both in the sheer volume of poetry he has made available to us, and in his profuse, erudite commentary that escorts the reader into the remote faith-world of a singular, medieval mystic from a Christian culture little known to most in the West." "The works of St. Gregory of Narek are central to the theological learning of the Armenian Apostolic Church and to its worship, yet their content is extremely sophisticated and their language can be very difficult. The festal hymns, though often seemingly light in style, are in fact particularly dense and bristle with philological problems. Professor Terian's work is more than a monument of meticulous scholarship. It elucidates the hymns for the first time and with a precision and insight far beyond any study ever done before; all subsequent work on Narekats`i will be measured by its high standard. That standard is unlikely to be equaled, much less superseded." "Abraham Terian is to be congratulated on this magnificent, ground-breaking volume of precise and elegant translations, richly annotated in succinct, highly informative footnotes and short introductions to each of the works. It is essential reading for a large variety of academic specialists, clerics, and laypersons: for those interested in the development of the Armenian liturgy and worship, for scholars of medieval literature and music, for all intrigued by the relationship between poetry, music, and theology, just to mention a few. Terian's volume is a precious gift, worthy of the learned monk whose work it is no exaggeration to describe as an act of Divine grace."